Following the late-night bombing of Syria on Friday evening/Saturday morning, everyone spent the day on Saturday posturing. Israel and most nations of the EU lauded the move, while Russia, Iran, and Syria blasted it. The Russians attempted to secure passage of a UN resolution condemning the attack, but given that all three of the countries who participated in the attack—the U.S., U.K., and France—sit on the Security Council, that was never going to happen. A perfectly executed strike last night. Thank you to France and the United Kingdom for their wisdom and the power of their fine Military. Could not have had a better result. Mission Accomplished! 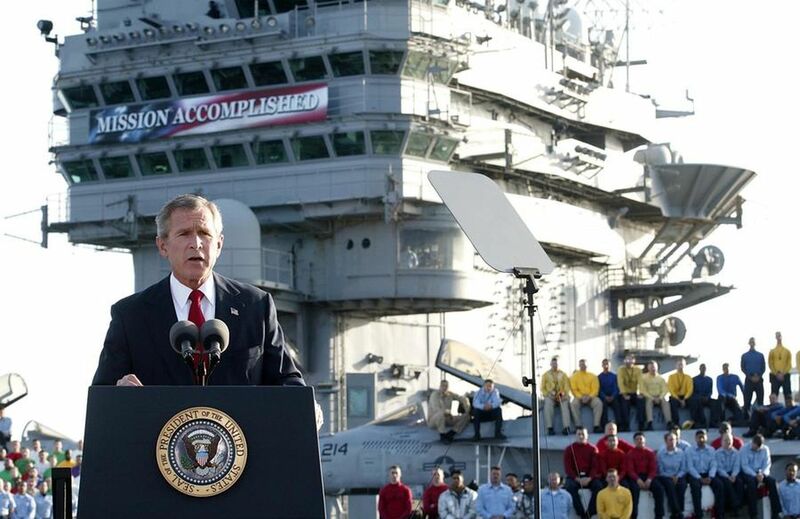 As you may recall, the United States' mission was not, in fact, accomplished when Bush made that speech. It would not be accomplished until 2011, if it ever was, and that appearance became a symbol of Bush's arrogance and cluelessness to his enemies (and even to some allies). One almost cannot imaging a worse tagline to borrow, unless it is maybe "Peace in our time!" That leads us to the second problem. Whatever the United States' mission is in Syria, it most certainly is not accomplished, and claiming otherwise is tantamount to goading Bashar al-Assad into another attack. Not unlike Trump's ill-considered declaration that the U.S. would be out of Syria in six months—a mistake he made just last week. The President himself seemed to acknowledge that likelihood, warning that the U.S. remains "locked and loaded" in the event of another chemical attack. Nearly every media outlet has a copy of the book written by former FBI Director James Comey, which is due out this week. Consequently, there aren't likely to be too many more juicy revelations from that source. However, Comey is in the midst of a press blitz, where he'll talk to just about anyone, from ABC News to the East Cupcake Middle School Monthly Cupcake. So, he's still going to make a few headlines before this is all played out. I was operating in a world where Hillary Clinton was going to beat Donald Trump. I'm sure that it was a factor. I don't remember spelling it out, but it had to have been. That she's going to be elected president, and if I hide this from the American people, she'll be illegitimate the moment she's elected, the moment this comes out. There is little doubt that one of the main goals of the Trump administration is to reduce regulation and corporate oversight as much as is possible. Team Trump is presumably beholden to the same swamp-dwellers the President promised to slay, and at the same time is apparently uninterested in the lessons of the Bush Jr. era, specifically as regards what happened on Wall Street. Anyone who needed evidence of this could look at the EPA as Exhibit A, and the Dept. of the Interior as Exhibit B. Now, the Consumer Financial Protection Bureau (CFPB) has clearly emerged as Exhibit C. The Obama-era creation undertook roughly three enforcement actions per month under the leadership of #44. In the 200 days since #45 forced out the leader of the CFPB, Richard Cordray, and added that job to the portfolio of Director of the Office of Management and Budget Mick Mulvaney, it has undertaken a grand total of zero enforcement actions. We're still waiting for numbers from our staff mathematician, but we believe that works out to an average of zero a month. On Friday, McClatchy reported that special counsel Robert Mueller has proof that Donald Trump lawyer Michael Cohen lied when he said he had never been to Prague, and that he visited the Czech city in summer of 2016. This would be confirmation of a key detail in the Steele dossier (although it would be much more meaningful with confirmation of another detail, namely that Cohen was there to meet with friend-of-Putin Konstantin Kosachev). McClatchy's reporting was pretty specific, up to and including exactly what country Cohen allegedly entered the Czech Republic from (Germany). And that is just what one reporter (thinks he) knows, and doesn't necessarily include everything Mueller knows. So, Cohen is playing with fire here. It's also an early indication that, as the screws are turned, he's planning on a Paul Manafort "resist everything" approach, as opposed to a Rick Gates "sing like a canary" approach. CNN's Sam Petulla was looking at the list of House Republicans who have announced their retirement (click on House Retirements above anytime you wish to see the current list). Comparing their reasons for retirement to Donald Trump's vote totals in their districts, Petulla found yet another compelling indication that the GOP has become the party of Trump. In short, the retirees really have two possibilities for their future career plans: leave public life, or run for a higher office. With only a few exceptions (mostly related to sexual harassment), the representatives who are leaving public life come from districts where the Trump vote was below the national average for Republican districts. And, with even fewer exceptions, the representatives who are running for higher office come from districts where the Trump vote was above the national average for Republican districts. The above item is not our only bad news for the GOP on the numbers front today. This week, the Harvard Kennedy Institute of Politics released a new poll about youth engagement in politics, based on phone interviews with over 2,000 18-to-29 year olds. And the conclusion is that these voters will be showing up to the polls this year in far greater numbers than usual. Generally speaking, the average midterm election attracts about 23% of voters under the age of 30. That was precisely the number that showed up to vote in the last midterm, in 2014. Among the folks who talked to Harvard, however, 37% said they intended to vote in 2018. Intentions don't always turn into action, of course, and in past elections there was about a 4% gap between "I plan to vote" and "I actually voted." However, if that 37% drops to 33% or even 30%, that's still a major increase from 2014. And, of course, young people lean Democratic—the Harvard respondents were 55% for the blue team versus only 21% for the red team, with the rest undecided. Gas prices always go up in the summer, as air conditioners and vacations both create greater demand for Texas Tea. This summer, the pinch is going to be particularly bad, with prices spiking by 14% on average, thanks to manipulation of the market by OPEC and Russia. That will give us the highest prices the U.S. has seen since a brief spike at the end of 2014, and the highest summer season prices in a decade. Is this really a political story, though? Yes it is. Republicans are very much hoping that the tax breaks they passed, or the solid jobs reports, will help them out in the midterms. However, studies have generally shown that gas prices matter more than either of those things when it comes to voter behavior. The reasons are plain. First, far more people are affected by gas prices than by joblessness, particularly when unemployment is at 4%. Second, many Americans purchase gas three or four or five times a month (or more), which means constant reminders of price increases, while payday tends to come once or twice a month. Third, $4 added to a $1,000 paycheck is barely noticeable. On the other hand, $4 added to a $40 tank of gas is a 10% increase, and is very noticeable.